Students from across the university are invited to tinker and maybe learn something new in the College of Engineering and Engineering Technology’s new Maker Space. One of the labs on the Engineering Building’s second floor has been reconfigured to provide space for students of any major to come in and work on technical projects, whether for class or themselves. The Maker Space includes basic hand tools, like pliers, screwdrivers and a drill press, all the way up to a laser cutter and a metal 3D printer. It also has electrical components like Raspberry Pi and Arduino boards. 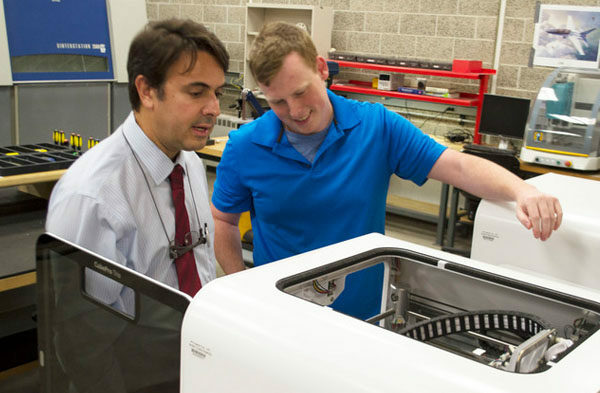 Student workers will be available during the lab’s open hours to help users operate the equipment or perform basic tasks for them, said Federico Sciammarella, an associate professor and interim chair of the Department of Mechanical Engineering. Sciammarella retained one corner of the lab for his research work. Edwards, who started as a finance major before switching to electrical engineering, said he values NIU engineers’ attitude of sharing with students in other fields. “One of the things I really liked when I got here was feeling right away like I was part of a community,” he said. The Maker Space is open from 3 to 8 p.m. Monday through Friday. To ensure equipment is used safely and fairly, students interested in working in the Maker Space should email jpeterson17@niu.edu or visit the Department of Mechanical Engineering in EB 226 to reserve a block of time.